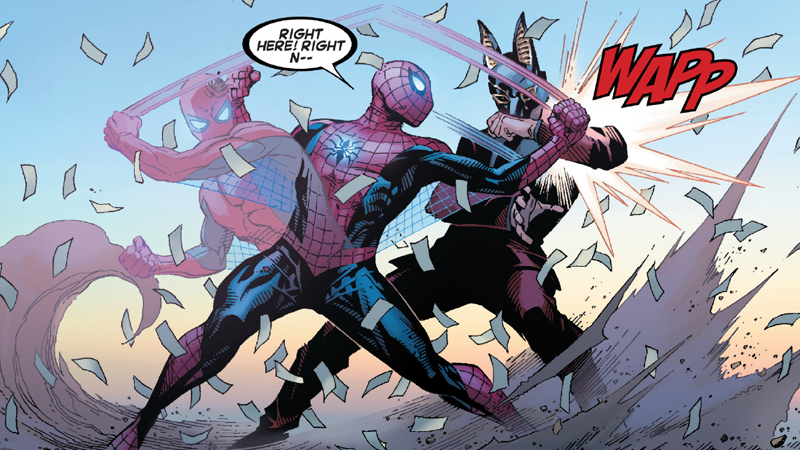 Marvel’s current big Spider-Man arc has seen the rise and return of several deceased characters from Peter Parker’s past, both friends and foes alike, thanks to the crazy cloning shenanigans of longtime Spidey villain the Jackal. But the latest twist in the tale is here and... well, it’s very much befitting for an event like this. So far Spidey and his friends—Spider-Gwen and Kaine—have seen the worst of what Miles Warren’s weird new cloning experiments have to offer in The Clone Conspiracy. Not just the painful returns of people like the original Gwen Stacy and her father, or Otto Octavius back in his own cloned body after years being trapped inside the Living Brain (it’s a long story). There’s also the revelation that, across different realities in the Marvel multiverses, there are futures where Peter Parker himself teams up with Warren and his “New-U” cloning technology and dooms the world to a zombie-esque apocalypse. In the current stage, Warren’s clones need to take pills to maintain the cohesion of their new bodies, otherwise they break down and melt. In other realities exposed to the technology, though, they turn into deadly viral carriers who extinguish pretty much all life on the planet. That’s already a whole heap of bad news for Spider-Man to face, especially with the revelation that there’s a good chance he’ll help the Jackal bring it all about for some reason. But that’s not the real twist in today’s Clone Conspiracy #3 at all. It’s that Peter discovers that the Jackal isn’t actually Miles Warren at all. Can we all really just take a moment to appreciate the really bad Scarlet Spider reference in this reveal? The Jackal behind this latest clone-mania is a clone himself. He’s Ben Reilly: the infamous Peter Parker clone that starred in The Clone Saga in the 1990s and was, for a while, Pete’s replacement as Spider-Man, before his own clone body broke down and Ben died. Also, he’s grown his roots out, which is the completely ridiculous reason he immediately gives Peter after the reveal above, as to why his hair is no longer blonde. So yeah, The Clone Conspiracy is going full-tilt into clone madness, in the only way a Spider-Man comic event possibly could. Is this a way to get Ben back semi-permanently? Will he share a different fate to all the other clones who’ve “returned” in this event? We don’t know the answers yet, but the issue does end with an extra twist—as if this issue hadn’t already twisted itself into contortions already. The newly-revealed Ben makes Peter the offer that, on all the other worlds in the multiverse where Spider-Man and the Jackal teamed up, he couldn’t refuse. The Uncle Ben trump card. Hoo boy. The Clone Conspiracy is ready to get even crazier than it has been already.